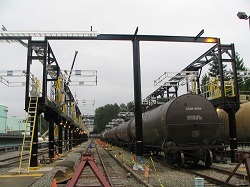 Safe Harbor loading racks for truck and railcar loading are designed for single spot or multi-spot loading areas. Our loading racks represent complete loading and unloading system designs, available in a variety of heights to suit specific applications. 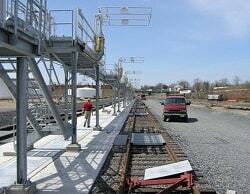 Pre-engineered platform configurations & custom designs. 1 1/2 standard pipe top rail, designed to meet OSHA standards. Serrated bar grating or other slip resistant walk surfaces available in stainless steel, aluminum or fiberglass. 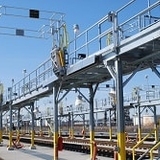 Platforms designed to support one or multiple gangways as required. Design loads for footing requirements can be provided. 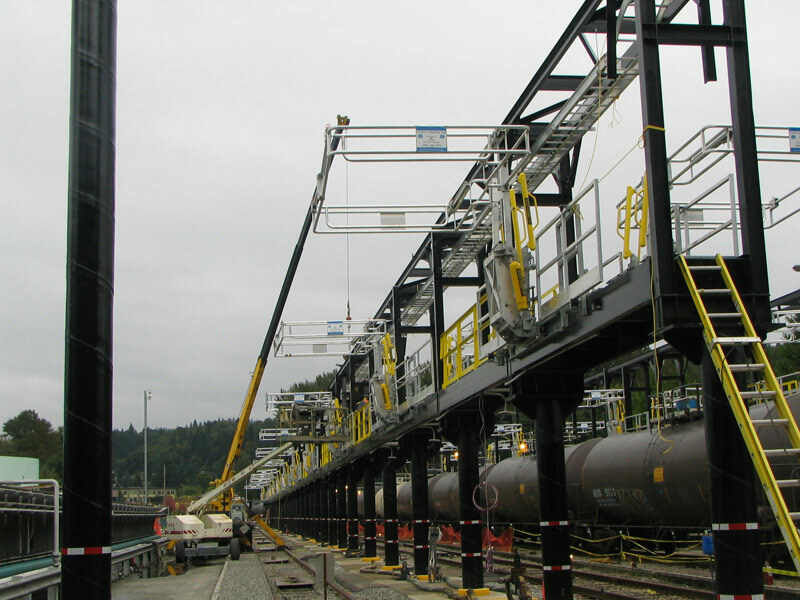 A hundred car tank train loading rack may seem like an overwhelming task to you but to Safe Harbor it's just another day at the office. Our trained and experienced engineering staff will put your mind at ease by asking the right questions during the preliminary stage of the project. Before a single piece of steel is cut we will assure that our engineered system is exactly how you envisioned it would be. Safe Harbor Loading Racks can be designed using either a single pedestal configuration or tower supports. Our single pedestal design requires a smaller footprint for situations where space is a concern. Another advantage of using a single pedestal design is the reduction in concrete footings that are required. By having less concrete footings you will save time and money during installation. 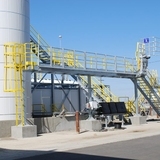 Our tower support design is primarily used when you need to have piping supported under the platform. It is also used if there are existing obstructions running down the center of the platform. Tower supports work best when a canopy is required or when there are loading arms involved. 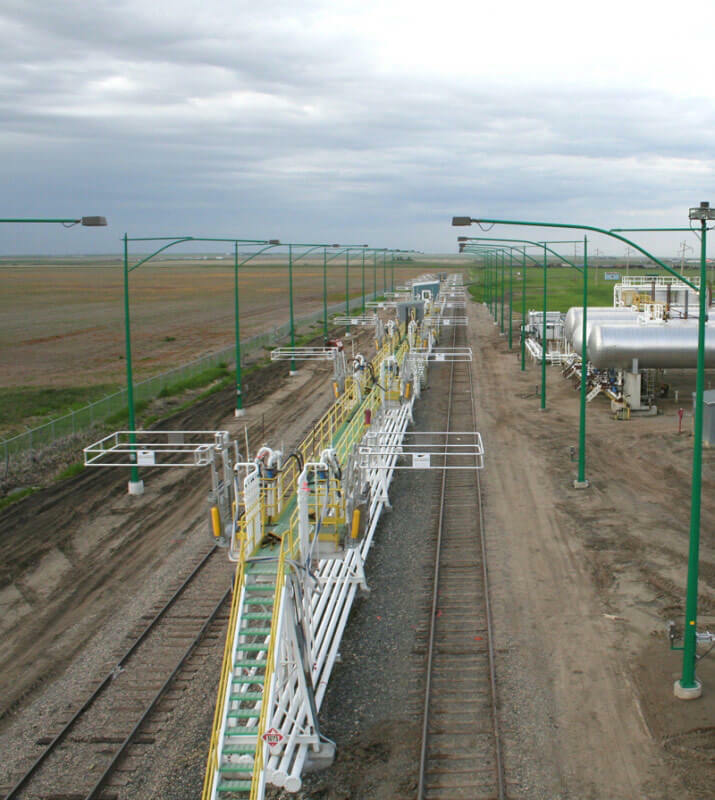 Multiple Rail Car Systems can be engineered to provide safe access for your operators regardless of whether the railcars are coupled or uncoupled. 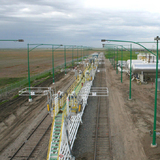 Safe Harbor's tracking gangways eliminate railcar mis-spotting issues that are common with coupled railcars. Safe Harbor will help to determine the best option for your application whether it's our self- closing swing gates, snap chain openings, or tracking handrails. 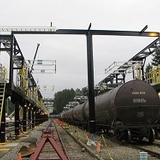 Safe Harbor's tracking gangways allow your operator to simply grab the top rail of the gangway and track the gangway to the railcar crash box opening. 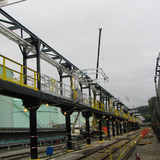 Once the gangway is spotted with the opening the operator will deploy the 100% self-supported gangway on top of the railcar and he or she will be protected with our OSHA compliant fall prevention safety cage. Our unique swing gate design is available in lengths of 6'-0", 9'-0", 12'-0", 15'-0" & 18'-0" sections. Our swing gates are 3'-0" wide opposed to the industry standard 2'-0" wide to reduce the number of swing gate post obstructions. A 3'-0" wide swing gate also allows for minor mis- spotting that occurs when positioning the railcars. Our swing gates are self-closing so your operator can concentrate on loading or unloading the product and have once less safety item to worry about. Our swing gates have a 42" top rail, midrail and a 4" toe board that meets OSHA Handrail requirements found in section 1910.23. This design is used primarily for retrofitting to older loading racks, existing piping obstructions, or for narrow platforms where our self-closing swing gate will not work. Safe Harbor's innovative tracking handrail design eliminates the possibility of a swing gate post obstructing the opening of the gangway walk surface. Our tracking handrail is available in 6'-0" and 12'-0" lengths. Our tracking handrail has 42" top rail, midrail and a 4" toe board that meets OSHA Handrail requirements found in section 1910.23. Do you have an existing fixed mount gangway but now you need a tracking gangway? Safe Harbor has you covered. Safe Harbor uses a modular base tread that can be changed from a fixed mount to a pivot mount or tracking gangway without having to replace the gangway. Our pivot mounts and tracking carriage mounts simply bolt on to our modular base tread. 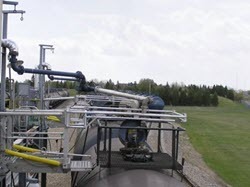 Safe Harbor designed and built this platform for a customer loading Ethanol. 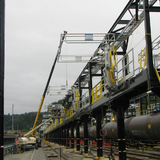 The customer needed to be able to load 20 railcars concurrently within a limited amount of space. 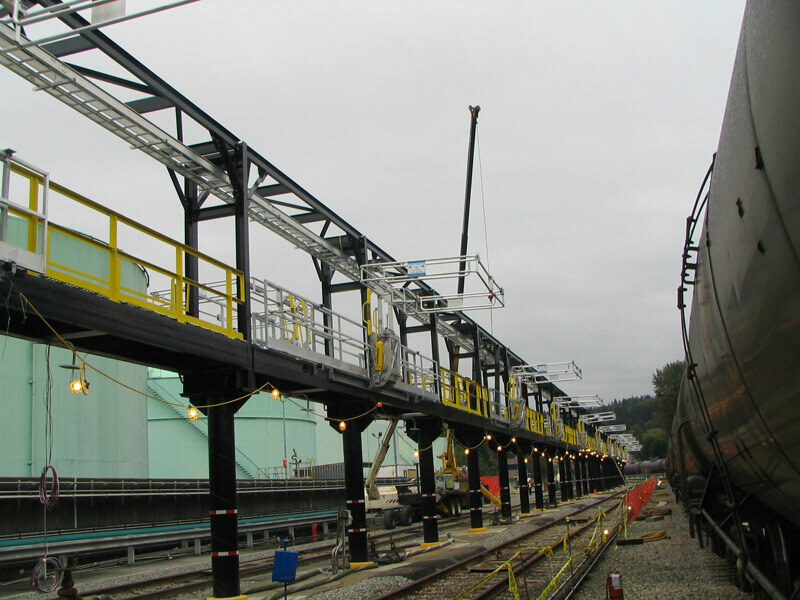 Safe Harbor designed and built the system to meet the customer's specific space requirements and still achieve the goal of loading 20 railcars at the same time. 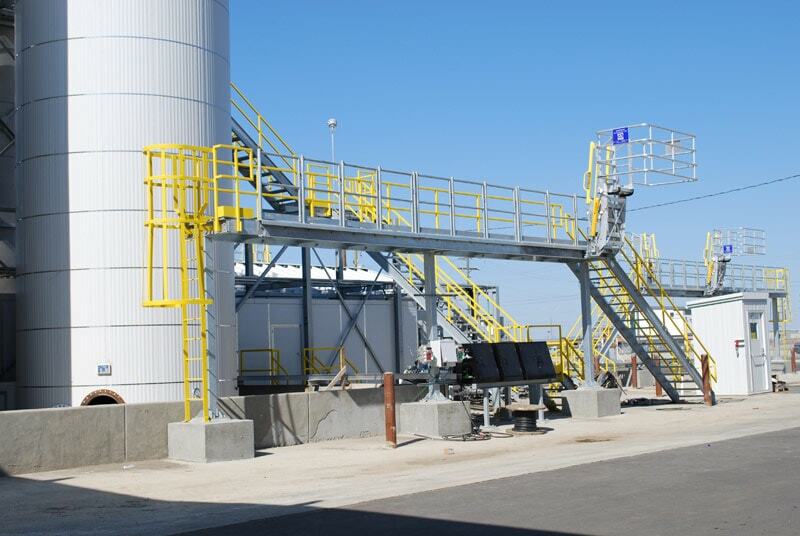 Our engineering staff custom designed the stairs and they created additional space under the platform to work with the customer's bottom loading hoses. 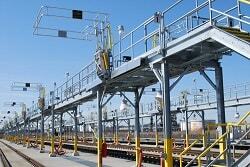 We used tracking gangways with tracking handrail to eliminate railcar mis-spotting.